I was talking with one of my girls friends the other day about a rash on my arm I have been battling with for some time. I have tried EVERYTHING… coconut oil, tea tree oil, raw shea, homemade body butter, and I even succumbed to over the counter hydrocortisone (yuck!)! But, with her great wisdom, she reminded me of calendula! Duh! I am so excited about this recipe! It is incredibly easy to make and took me less than TWO minutes! 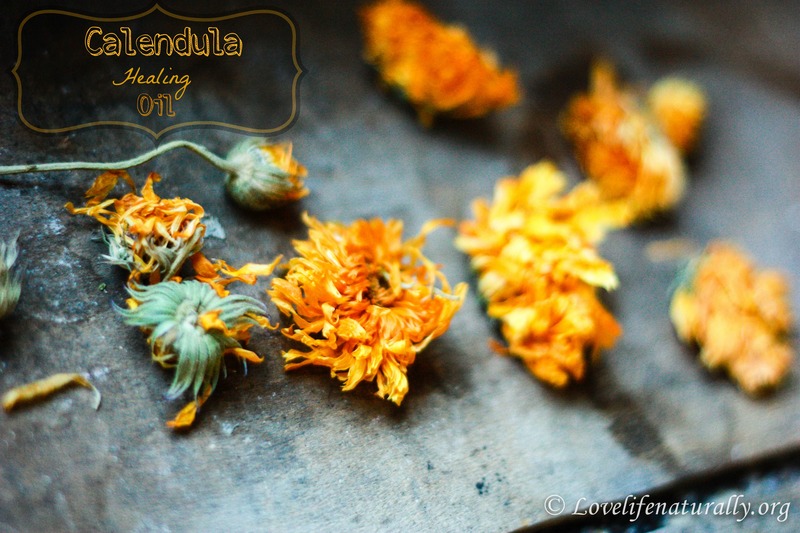 Calendula or Pot Marigold flowers aren’t just beautiful, they are incredibly healing. 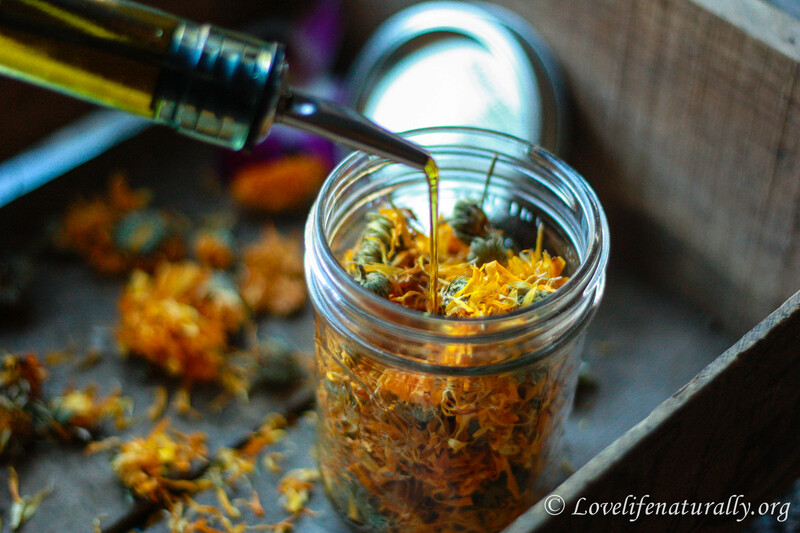 I have seen creams, salves, oils, and diaper creams which contain calendula and have used them on my sons precious baby bums (prior to making my own diaper cream), but they can be expensive! However, calendula’s healing benefits are so worth it, I just had to make my own for a fraction of what you would pay in the stores. 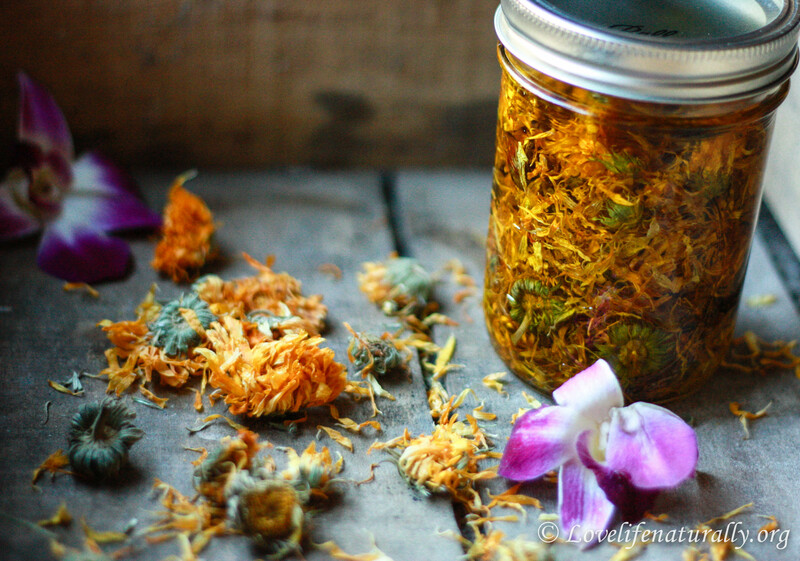 Fill jar loosely with dried calendula flowers, not packed. Fill with oil until all flowers are covered and saturated. Cover tightly and let sit for four to six weeks in a sunny location. They make a beautiful gift! I made a few and wrote the date on the bottom with some masking tape so I remember when it was made. 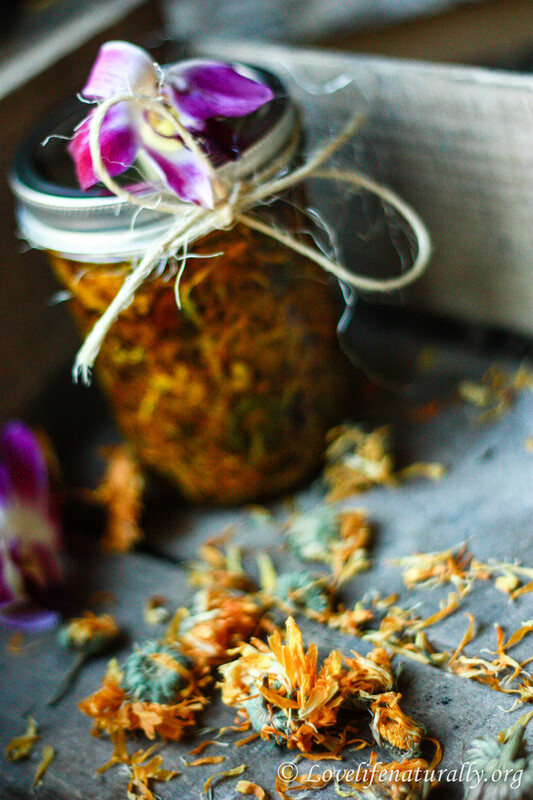 After four to six weeks, using a fine mesh sieve or cheesecloth, over a bowl, strain the flowers so you just have the oil left and return to your mason jar. Massage into skin and watch the healing begin! If you need some right away… heat oil and flowers over extremely low heat (no hotter than 100 degrees Fahrenheit) for about five hours to allow the oils to infuse. Store in a cool dark place (like your medicine cabinet). **You can add the oil to my homemade diaper cream by adding one or two tablespoons in addition to or in place of the vitamin E oil. **You can also add to my homemade body butter recipe by replacing 1/4 cup of the sweet almond oil with the calendula healing oil. We all got the flu this year right before Thanksgiving, and after it passed, I broke out in the most horible psorisis from head to toe! I have tried everything to heal the spots (olive, coconut oil, creams) but I really dont want to use steroids. I will have to try this for sure! I plant marigold in our veggie garden to control pests, and I love that there is another great use for them! Oh gosh! That is terrible! The flu is no fun! How perfect that you have marigolds already growing! Just dry them out and they will be perfect! Awesome info Sara! Glad to be a part of gaining all your natural wisdom. Thank you much Julie!!! ❤ I am definitely learning as I go… which is why I love writing! We can learn together! I bet sweet almond oil would make this smell so good! I forgot to add that marigolds actually look like daisies. I just love calendula. I have been using it in my healing salve but I also love it in my herbal tea mixes. Not only that but the dried flowers are so beautiful. Thank you for this great posting….love your blog! Awe thank you Susan! 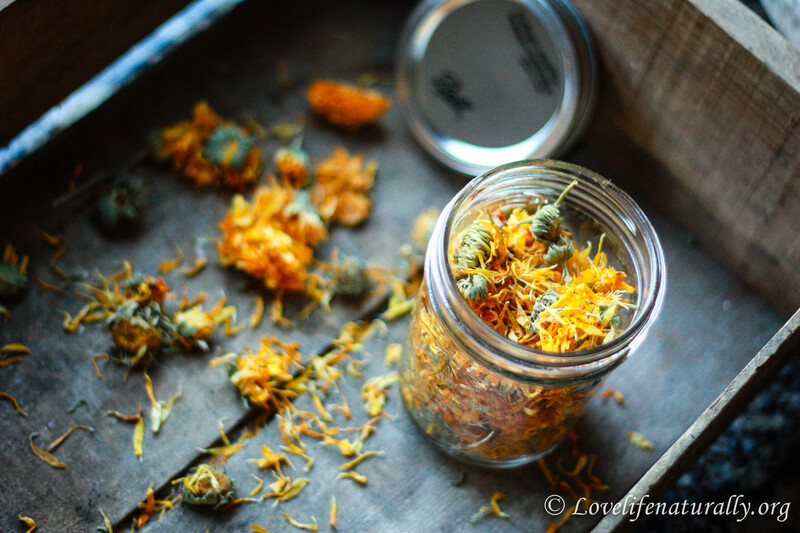 Calendula is an amazing herb! Do you make your own salve?